RS Productions » UK-based film & television production company, established by Mark Lavender & Derek Smith. Love is not what it seems! A same-gender, cross-dressing romance. A contemporary (reworking of Shakespeare's) As You Like It, set amongst sun, sand and seasonal working. RS Productions is a diversified media company encompassing film, television and new media production. It was established in 1993 by two award-winning television professionals, Derek Smith and Mark Lavender. The company is keen to collaborate with established and new talent. Just before North East celebrities like Alan Price, Bryan Ferry and Sting arrived on the scene, there was another recording star on Tyneside - a talking budgie called Sparkie Williams. Sparkie had a vocabulary of 553 words and could recite 8 nursery rhymes in both Geordie and RP. He became a national celebrity even appearing with Cliff Michelmore on the Tonight programme. This film looks at the surreal events behind Sparkie's rise to fame, the discs with Parlophone, the TV commercials, and the clutch of medals he won. 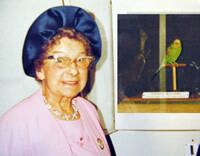 Sparkie's owner and teacher Mattie Williams left a remarkable diary which is used to tell the story in her own words and convey the touching relationship between mother and budgie. Sparkie's passing in 1962 has been likened by Michael Nyman who has written an opera about Sparkie, to the death of Little Nell in Dickens' The Old Curiosity Shop. Blind Eye was funded as part of this year's Digital Media Shorts. "Set on a moving bus - with two fight scenes and a large cast of young actors - it's been quite a challenge. But we're very pleased with the result. The performance from Liz White, who plays the lead, is outstanding - and all of the children shocked us with their startling and convincing portrayals" said Laura Degnan. "The feedback so far has been terrific, and we will spend the coming months submitting Blind Eye to various film festivals" said John Phillips. The uncompromising and claustrophobic nature of this film will force every viewer to confront their own thoughts and fears about this difficult and crucial subject. Derek Smith and Mark Lavender, the principals of RS Productions, worked as Director and Producer on the major 3 part series about the travels of the writer and humorist Edward Lear in the turbulent Southern Balkans. Filmed in High Definition Exile in Paradise is currently being marketed world wide by Electric Sky. Exile in Paradise wins Arts Silver World Medal in New York. The series took away a main prize in the prestigious New York Festivals TV Programming Awards 2009. Filmed and directed by Derek Smith for City University, Heartsounds is a unique experiment which took UK mental health service-users and workers to Uganda to meet their counterparts in the cause of service-user empowerment. The group had special access to the only hospital dedicated to the treatment of mental health in a nation of 30 million but they also found a wealth of vibrant activity led by NGO's and volunteers out in the field. Witchdoctors and faith healers fill in the void of resources and Derek came back with some powerful footage of rarely filmed faith healing ceremonies. RS Productions has won the support of the EU's MEDIA Plus fund for the development of a new project - Midday Sun by Steve Lewis and Tony Owen (See below). This script was recently optioned by RS Productions. "This is affirmation of our confidence in this project" says producer Mark Lavender. Northern Film & Media has continued to support RS Productions. NFM was critical to the distribution of Frozen and also to other projects. Business Link Tyne and Wear is a supporter of RS Productions particularly with advice and marketing and publicity materials. RS Productions Midday Sun is an RS Production in development. It has been described as a cracking great story... A couple's dream of the good life in Spain turns to a nightmare when their son is killed. Dan is revenged of the murder of his son by a mysterious stranger, Liam. Liam has done a deal with Dan who is drawn into a web of deceit, murder and revenge. Ciaran Hinds and Emily Watson are now attached to Midday Sun to be directed by Mark Brozel in 2010. Frozen was released in January 2006 theatrically nationwide on 20 prints. The release was supported by Living Films LLP and Northern Film & Media as well as the UK Film Council. It is currently available on DVD from Amazon. The Lost Communities of Industrial Teesside, Photography by Derek Smith is an exhibition of Dereks work recently on show at Chats Palace in London during PHOTOMONTH and is now on tour. © 2019 RS Productions UK · Registered in England and Wales as Rough Sea Productions.